در اینجا به شرح مشکلات رایج در مونتاژ قطعات SMD به وسیله کوره های مخصوص (REFLOW OVEN) می پردازیم. پروفایل استاندارد مورد استفاده برای مونتاژ SMD به صورت کلی به شکل زیر می باشد. FLUX ACTIVATON : با رسیدن به یک دمای آستانه ، سرعت گرم کردن کم می شود و فلاکس شروع به فعال شدن و تغییرات شیمیایی می کند. REFLOW : قلع بصورت کامل ذوب شده و بر روی pad و پایه های قطعات جاری می شود. COOLING : بصورت تدریجی ، دما پایین کشیده می شود تا کمترین تاثیر را بر روی قطعات نیمه هادی داشته باشد. در ادامه به شرح مشکلات رایج و روش جل آنها می پردازیم البته برای جلوگیری از هرگونه دخل و تصرف در آن متن انگلیسی ان را برای شما دوستان قرار داده ایم. As mentioned earlier, the ramp to dwell ramp to peek (RDRP) profile was developed for infra-red (IR) reflow ovens. This technology tends to heat unevenly and in some respects more slowly than convection ovens. Consequently the dwell, usually at 140 to 160°C, was developed to assure as even as possible heating with IR technology in the solvent evaporation and flux activation stages of the reflow process. 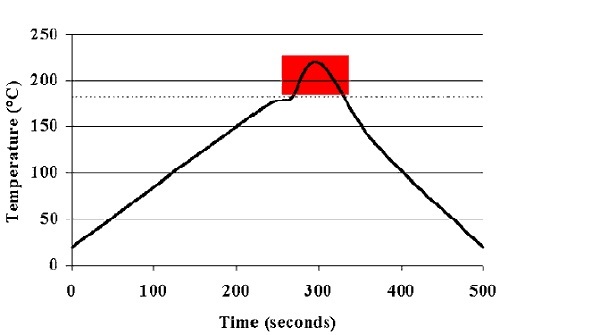 The ramp to peak was then employed to minimize the time above liquidus (TAL) and the possibility of singeing components. When IR technology was deployed, 0402 passives, ultra-fine pitched PQFPs, BGAs, CSPs, and other “high tech” components were far in the future. Unfortunately, each of these now dominant technologies has a problem with the RDRP profile. Many of the failure mechanisms, common today with these components, can be traced to the use of the RDRP profile. Tombstoning is a phenomenon in which uneven melting of the solder paste causes the surface tension of the melted solder to lift the passive as shown in Figure 3.
a brief dwell as the oven passes through the melting point of the solder to minimize this failure mode. This failure mode is almost unavoidable with RDPR. As the RDPR profile goes from the soak temperature of 140 to 160°C, it shoots straight up to the peak reflow temperature. This fast temperature rise from below to above liquidus will often cause the solder paste at one end of a passive to melt before the paste at the other end. The surface tension of the melted solder will cause the passive to tombstone. The Lee Profile minimizes tombstoning by establishing a brief dwell as the profile goes through liquidus. This dwell allows for more even temperatures as solder paste at the component leads goes through liquidus. This profile melts the solder paste at both ends of the passive simultaneously, hence minimizing tombstoning. Wicking occurs when the leads of the components become significantly hotter than the PWB pads during reflow. 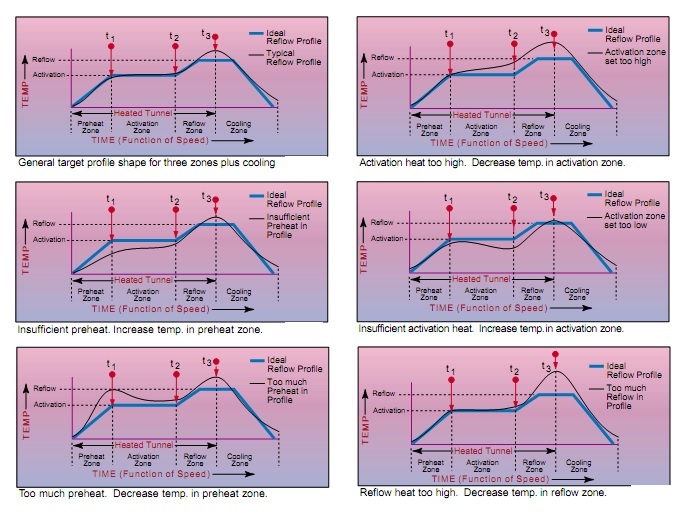 Since solder flows to where the temperature is highest, opens can result as seen in Figure 4. The RDRP profile typically ramps from 1-2°C/s from its dwell. This high ramp rate and the lack of a dwell at liquidus can result in the leads being much hotter than the pads. Wicking will then often follow. The Lee Profile’s more gentile heating rate of 0.5 to 1.0°C and a brief dwell at liquidus help to minimize such wicking. Solder balling is an all too common phenomenon today. The RDRP profile can be the culprit. Its rapid ramp rate can cause the solvents to escape so rapidly that spattering of the paste occurs. In addition the long time at a relatively high dwell temperature can result in oxidation. The combination of these two mechanisms can create solder balling. The spattering disperses the solder paste and the oxidation prevents coalescence of the melted solder into the solder joint. The Lee Profile’s gentler ramp rate minimizes spattering and the lack of a long dwell reduces oxidation. Therefore, the Lee Profile has a tendency to minimize solder balling (see Figure 5.) However, stencil design can also be a factor as Dr. Lee points out in his book1. 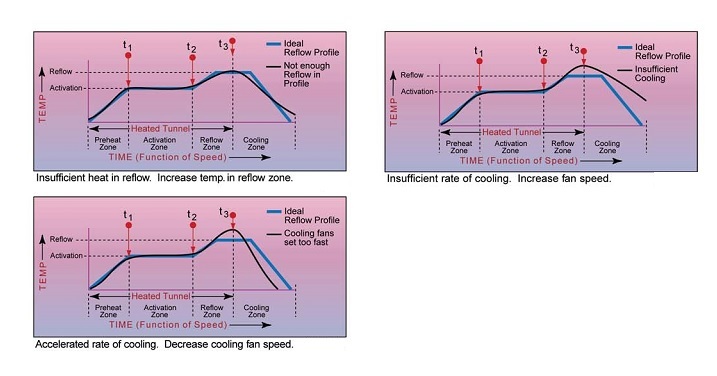 Figure 6 – The long dwell at high temperature can cause Hot Slumping or even Bridging in reflow. The gentle ramp of the Lee Profile minimizes this effect.